Today I did a kitchen inventory and rotated my pantry, task I perform every 3-4 months. And each time I find some dry ingredient that I forget to use for some time. To my delight I bumped into a jar of buckwheat. I need to tell you, that I don't actually have a real pantry, a room with shelves from top to bottom, where dry goods stored on one side, preserved food on the other, and all my "technical support" in the middle. That's a dream pantry. In reality I have a couple tight places where I keep my dry goods in mason jars in two rows, hence sometimes I forget what is in the second row that I don't see. My preserved food and "technical support" Kitchen Aid stand mixer, juicer and food processor occupy a bookshelf in the kitchen/dining area. Back to buckwheat. I simply cooked one cup of buckwheat groats in two cups of water, and served it with roasted vegetables, bound together with sauteed shallots and tomato sauce. 1. First cultivation of buckwheat was around 6000 BC. 2. Too much fertilizer, nitrogen especially, reduces yield of buckwheat. 3. Buckwheat has no gluten. 4. Buckwheat is not related to wheat grain; it comes from the same family as sorrel and rhubarb. What is you favorite food made with buckwheat? 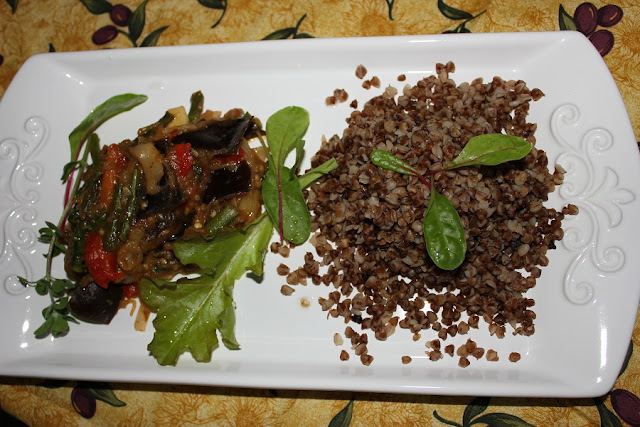 Marina-your creation of the buckwheat paired with the roasted vegetables are incredibly delicious, and so healthy. Thanks Elisabeth! That pasta and buckwheat sounds very interesting, I need to try it. When my parents were here, we had buckwheat almost every other day in one form or another. I too forget about it and don't use as often as my mother. I have a cupboard full of dry goods that I forget about or can't think of anything to cook with them. I really must use that freekah, polenta, cracked wheat, couscous etc more often. My husband keeps me on my toes: he doesn't like when food is wasted, and actually neither do I.
I have never cooked up buckwheat and eaten it like that! I love buckwheat, but I usually grind it and use it as a flour! Thanks for the inspiration! We grew up on buckwheat similar to this one, but I hated it when I was little. The only way I ate it was with milk, like cereal. Funny how our taste changes! I've never cooked with buckwheat but you have me intrigued! Your meal sounds yummy!